To create the perfect winter wedding it's all in the detail! Use embellished decorations and twinkling lights for a magical look. Mix pretty DIY decorations with flowers, foliage and candles to establish simple and elegant displays. Achieving a winter look which is also warm and inviting can be tricky especially when using a lot of cooler white tones and metallics. 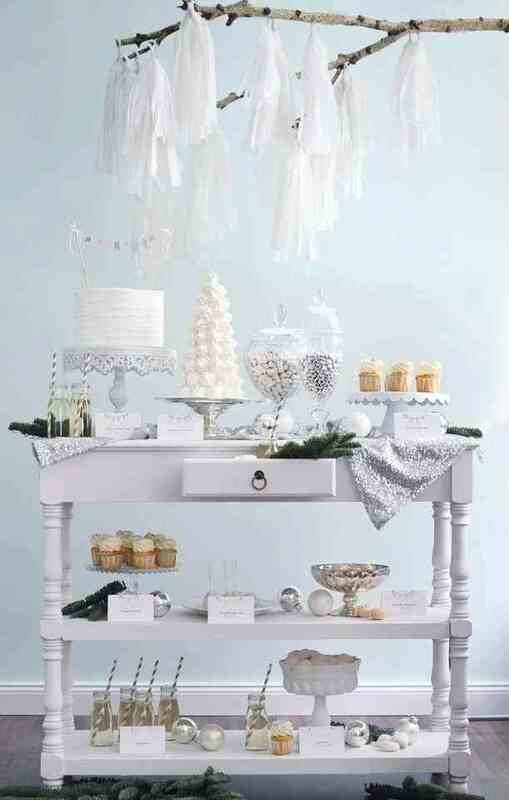 Display lots and lots of candles and strings of fairy lights for a flickering warm glow in your winter themed wedding. Add touches of seasonal foliage to your centre pieces and displays and stick to luxurious fabrics such as satin, velvet and lace. If you want the wow factor but don't have the time then concentrate on a few key points in the room such as the desert table and the main table centre pieces and then create paired down simpler versions for the other tables but in keeping with the same style. There are so many beautiful DIY possibilities for decorating your venue. One idea is to simply get some long thin tree branches, cut them to size and then after they are cleaned paint them in either stark white, silver or gold. You could even just paint a layer of glitter paint over the bare branches. Display them with your flowers in tall vases in the centre of your tables, use flowers and other foliage of different heights in the vase and cut the branches at slightly different lengths for a more natural look. Pine cones are beautiful when used as decorations too and can easily be painted as well. String up your painted pine cones with pretty ribbon or lengths of lace and tie them to the backs of your chairs. Or display the pine cones in the wedding bouquets and have them dotted around your table centre pieces. 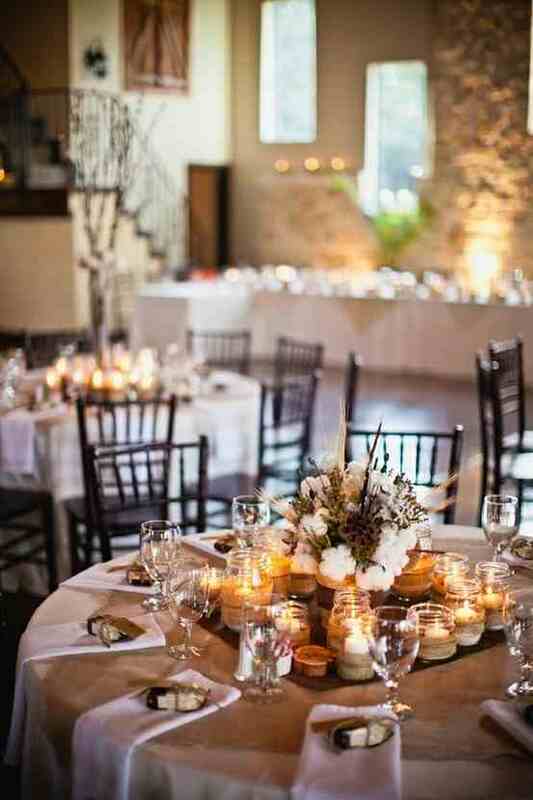 A rustic look can be great at a winter wedding. Use off cuts of real pine trees and add them to your table setting displays or in various places throughout the venue. Cut tiny sections of the branches with pine needles, add some cinnamon sticks and tie around your napkins with thick twine. Or you could even use lace for a more feminine look. Not only will this look beautiful but it will also smell glorious! Although it's tempting to go overboard when using glitter only add touches of glitter here and there for a subtle sparkling look. Get some round glass vases and mix glitter in with the water before adding the flowers. If you have some simple glass tea light holders or even glass jars then sprinkle some glitter inside and then place the candle on top. This can be beautiful as well when done with larger candle lanterns. Use lace and ribbon to tie around plain class jars, creating an elegant and simple candle holder. Another nice touch is to use delicate lengths of beaded string and tie them around your vases, candle holders, chairs or anything that could do with that added bit of sparkle! For inspiration and selected image sourcing visit our pinterest page!